Palo Alto, Calif.-based Azumio isn’t exactly a household name when it comes to mobile apps, so one might be surprised to learn that, collectively, their apps have pulled in over 20 million downloads. That’s because Azumio is plugging away at building a suite of biofeedback apps that measure your heart rate, stress, and sleep. Azumio is tapping into a hot trend, as health devices and mobile apps are on the rise and have found eager users outside of the tech community. Companies and devices like Fitbit, Lark, Up, and more have found traction among consumers, but most of them involve external hardware that is worn while you sleep. That’s why today Azumio is releasing an app appropriately called Sleep Time, which measures the quality of your sleep and provides you with an alarm clock — without the extra hardware. Using your iPhone’s accelerometer, combined with their own proprietary algorithm, Azumio measures both your movements during sleep, as well as the different phases of your sleep cycle, so that the app can wake you up at just the right moment. The idea, of course, being to wake you up at just the right point to avoid having to deal with grogginess, etc. Sleep Time analyzes your subtle movements throughout the course of the night, graphing your sleep cycles, and wakes you up at the right time. All you have to do is leave the app on your mattress. Considering I practically sleep with my smartphone on my face at this point, this won’t require a big change of behavior, and that’s really where Azumio is hoping to distinguish (or beat) the competition. Zeo, Lark, and Up all make smart, well-designed devices, and if you’re going to have to keep an app on while you wear a device, you might as well just have that app close by. It may not work for some people, but for others it may provide a nice alternative to wearing the equivalent of a headlamp on your head. 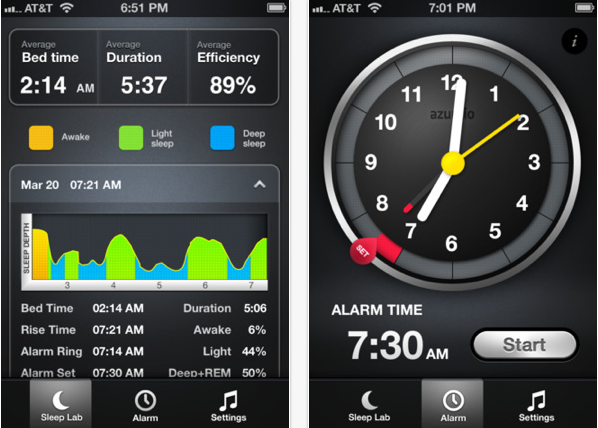 The app itself was built by Azumio in collaboration with researchers from Stanford University, and Dr. Paul C. Zei, a clinical professor at Stanford, said that the real value of devices like Lark and apps like Sleep Time is that there’s a strong corollary between sleep patterns and a healthy heart. “Azumio has fulfilled the need for an accurate, state-of-the-art algorithm for sleep analysis that is consumer-accessible as an integral part of a complete mobile health solution,” the professor said. The Stanford professor hits on an important part of Sleep Time’s value, in that the app really isn’t just a standalone product, it’s part of a suite of biofeedback apps that are intended to improve your overall health — not just your sleep. This could be big for Azumio. They’re not quite to a point where they have one dashboard, where you can track health, sleep, stress, etc., a place to make that data actionable, to track all your important health signals on your phone (without an external device), but that’s where they’re headed. Azumio also gave us a little exclusive look at their overall downloads. Its flagship apps, Instant Heart Rate (which uses your iPhone camera to detect pulse on your fingertip) constitutes the majority of Azumio’s 20 million downloads, and is currently racking up 200,000 downloads per day. Last week, the app saw more than 1 million downloads. It’s impressive technology, but that kind of response was unexpected, Azumio said. And clearly they’re hoping that Sleep Time and others can piggyback on the success of Instant Heart Rate to take the app development startup to the next level. For those interested in testing out Sleep Time, Azumio is offering up 1,000 redeem codes to download its app from iTunes. You can access those here. Azumio raised $2.5 million in Series A financing from Founders Fund and Accel last July.